urbestvalu has no other items for sale. Explore your nature with the Bushnell Falcon 13-3450 binocular that brings you close to your beautiful surroundings. 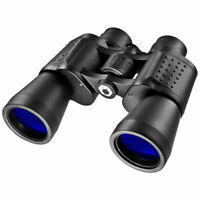 Loaded with porro prism coated optics, this Bushnell binocular provides you with sharp and bright view of images. This Bushnell porro prism binocular is equipped with InstaFocus focus system, which gives you central focusing lever to spot fast moving objects precisely. The Bushnell Falcon 13-3450 features field of view of 300yds/ 100m to offer you to see broad area of the surrounding at one go. The rubber grip of this Bushnell porro prism binocular lets you hold it comfortably and securely. This Bushnell binocular is constructed ruggedly that gives you company in every weather conditions. For a name brand product at a very reasonable price I was skeptical. Boy was I surprised! Just goofing around I went to the end of my street and looked down the road through them, I could clearly read a turn lane sign over a mile away! I bought them to use out on open water in the gulf of mexico for fishing, and looking at what appears as just a white dot on the horizon (with these bino's) I can Identify what type of boat I'm looking at. Very impressed. The product is very powerful. I can spot a bird in a tree from 1/2 a mile . Love the way it auto adjust the focus. It comes in a casing with covers for the lenses . Very professional looking. My grand kids love it. Although I wear glasses, I can still see through it , with or without glasses. I love this product . Great value for the money. Seeing the binoculars in a picture is actually not the same as having them in hand. For the price, they are actually pretty good, but there are several things that the potential buyers will have to take into account. 1. The minimal distance focus is actually pretty large. You can't focus with these binoculars at distances below 70 or 75 feet, which is actually a lot if you are a bird watcher. 2. The construction is good, except for the piece that holds the eyepieces together and moves back and forth when you adjust the focusing wheel or lever. This piece that should be rigid enough to move both eyepieces at the same time without bending, is actually made of thin plastic, so it bends if you put even a small amount of pressure in the eyepieces against your face. Under my point of view, this is the Nr 1 drawback of these Binoculars. I don't think that making this piece of even a cheap metal would increase the price too much, if any. 3. The optics are pretty good and the 50mm lenses give a great luminosity. You can use the binoculars almost dark with no problems. 4. They have a diopter adjustment in the right eyepiece, which is good if you have an even small difference in sight capabilities from one eye to the other. 5. I personally don't like the "Insta-view" focusing adjustment system that Bushnell is using in their binoculars. It is a lever that don't allow for much adjustment range. I would sincerely prefer a wheel that would allow for a bigger adjustment range in focusing closer objects. In brief, a nice pair of binoculars with good optics, that is the most important feature in the end, but not suitable for all types of applications. Suprisingly great value! Great Product! Live on the water and there is always something to look at and my old pair of binoculars became mis-aligned. I bought these as a cheap replacemnt and my expectations were low. To my surprise, these are very nicely built. They have a quality feel about them. The optics are surprisingly clear even at max magnification. Great buy!